I sing with Elmbridge Ladies Choir www.elmbridgemusic.co.uk. It was with great excitement I travelled with the choir and our sister mixed choir, Elmbridge Choir to the Veneto region outside Venice for the first Veneto Canta choral festival in May, open to choirs of all repertoires. Altogether we were a group of 181 – although everyone flew to and from Italy independently. At GatwickAirport, we enjoyed a snack at Eat www.eat.co.uk, although Ray had difficulty finding a dairy free sandwich but finally found a duck wrap. I ended up with a Rainbow Salad – prosciutto and lentils, rice, peas and sliced hard boiled eggs. Although delicious, it was a disappointment not to find something more substantial. At the Noventa Hotel in Noventa Di Piave, a town outside Venice www.noventahotel.it , our base for the trip, they had laid on a cold buffet which was impressive, given the lateness of the hour. So Ray and I enjoyed cold meats and salad, although Ray could eat the Italian bread which he said was delicious. I tried not to look at the bowls of pasta on the table, which looked tantalising. Another member of our party, who’s a coeliac, had sensibly brought his own gluten free bread and also had some salad and fruit salad. The group was staying at three different hotels; we were at the Base To Stay www.basehotel.it – yes a strange name for a hotel! From the breakfast buffet, I chose ham, cheese, a hard boiled egg and rice cakes. Ray selected toast and honey, ham and olives. As he said “It was a funny breakfast”. We were pleasantly surprised by the tea – Bradley’s English Blend www.bradleys.nl, which we hadn’t come across before. Normally Liptons tea is served in Italy which is an acquired taste! Ray asked Base To Stay for a map of the town and was told “There isn’t one. There is only one street.” “That’s good,” I said. “Then even I won’t get lost.” We were told there was a market in the town, but they weren’t sure whether it was taking place as it was raining so heavily. As we looked outside it was raining slightly, so with our friends all armed with umbrellas, we started walking to the centre of Noventa di Piave to see the market, but en route the rain became torrential. I was wearing open toed sandals – not very sensible – and gradually we all became soaked despite ponchos and umbrellas. The market sold traditional Italian produce; there were colourful displays of fruit and vegetables including white asparagus. A vast cheese stall sold an array of Italian cheeses so Ray bought some goat’s cheese. Our real quest was to find McArthur Glen www.mcarthurglen.it designer outlets, which we had been told “were just the other side of the roundabout”, so bravely we marched on getting wetter and wetter. My skirt was sticking to me and my legs and feet were saturated, despite my raincoat, poncho and umbrella! We arrived at the roundabout from hell – cars were being driven at breakneck speed in true Italian fashion in about six different directions. We just couldn’t see a way to cross; by then, we were so wet we were beyond caring, but someone suggested returning to the hotel and getting a taxi. The taxi driver must have misunderstood because suddenly we were being driven Italian racing car style along a motorway in the opposite direction to McArthur Glen! No-one could speak sufficient Italian to query this so we just hoped he wasn’t taking us too far away. Eventually we arrived at Iper Coop Centro Piave www.centropiave.com, an out of town shopping centre, with a huge Coop supermarket in the basement. Here we were able to buy Alpro soya milk www.alpro.com.uk. We noticed there was a small “free from” section with products “senzo glutino” (without gluten).We negotiated with the taxi driver to pick us up again in a couple of hours. It was wonderful to be in the dry again, although I was unable to try on any shoes because my feet were so wet! After browsing round the shops, we had lunch at El Baristo self service restaurant. We always like buffets because you can see exactly what you’re getting. I enjoyed a huge tuna salad and an exotic fruit salad with strawberries, while Ray ate chicken fillets, potatoes, beans and carrots – after checking it was “senzo burra” (without butter). That evening we were whisked to Teatro Opere Parrocchiali in Thiene for the opening concert. It was like an enormous school, but the auditorium was most impressive. They had laid on a small snack of cheese, crisps, salami and cheese rolls. Many people visited the small café, but the staff were not geared up for so many people. In fact they ran out of cups so gave Ray a jug of hot water for the tea (we always carry out own decaff tea bags) and he managed to negotiate a couple of glass tumblers to pour the tea into. An eclectic mix of choirs performed that night as well as Elmbridge Choir and our choir, Elmbridge Ladies Choir including a group of Glee-like youngsters who danced as well as sang. The next day my choir, Elmbridge Ladies Choir, visited Duomo di Conegliano in Conegliano, where we were given a guided tour of the tapestries and frescoes. Fortunately, one of the choir members, was able to translate what our Italian guide was saying. Lunch was at Ristorazione Ottavian www.ristorazioneottavian.it in San Vendemiano, a huge cavernous restaurant with a vast buffet. I was able to choose chicken with prosciutto and mozzarella and salad. Prosecco was on tap – literally – you pressed a button and it was dispensed into a plastic glass; there was a choice of red and white. It was here we discovered the ‘hole in the ground’ toilets which someone referred to as “squatties”. That afternoon we visited the Collalto Wine Cellars where we learnt how prosecco was produced. This was followed by a prosecco wine tasting and an opportunity to buy some to take home. Giovanna Altinieri explained the process and history of the vineyard. “There are 250 hectares, 150 of which are dedicated to vineyards. We use flowers to produce new varieties of wine – male and female flowers are blended to produce sparkling rosé – normally rosé is produced by mixing red and white wine. After this was the Abbazia di Follini, where we had a cup of coffee at Café Pascucci www.pascucci.it - oddly, a fresh mint tea was 3 Euros whereas a cappuccino was 1.5 Euros. At Miane, we were welcomed by our host choir Coro Montecimon, an all male Italian choir, who had laid on some refreshments. Someone pointed out to me the special gluten free crackers and snacks, which I enjoyed with a glass of Prosecco. Despite technical difficulties with playing our backing tracks, the concert seemed to go well, but it was our last number “It’s Raining Men” which brought the house down with clapping and cheers – so much so we had to sing it again! 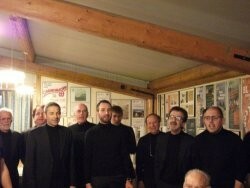 The male choir hosted a dinner for us at Proloco in Miane, a community restaurant run by volunteers. The food was superb – starters of polenta and mushrooms, followed by asparagus risotto then meat, chips and salad, accompanied by wine of course. Half-way through our hosts Coro Montecimon got up and sang impromptu without music or accompaniment including “Blue Moon” in English! A memorable night. On the last day in Venice, we located Ostaria al Garanghelo, San Polo 1571, 157 Calle Dei Boteri, but despite a long wait, I was served gluten free pasta carbonara. I had been told Italy had embraced gluten free pasta, but never believed it until then. The day culminated with all the choirs which had participated in the Festival meeting in St Mark’s Square where we all sang Italian songs – accompanied by music of course! What a way to end our tour!